The new 250 hp (184 kw) 2.8-liter V-6 Turbo engine in the Saab 9-3 Aero Sport Sedan, SportCombi and Convertible represents the culmination of almost 30 years’ experience from Saab as acknowledged leaders in the art of turbocharging. The 9-3 Sport Sedan Aero with its new V-6 Turbo is, quite simply, the fastest accelerating car ever to carry the Saab badge. In the new 9-3 Aero, Saab customers are now able to enjoy the combined benefits of turbocharged power and six cylinder refinement in a purpose-built package. 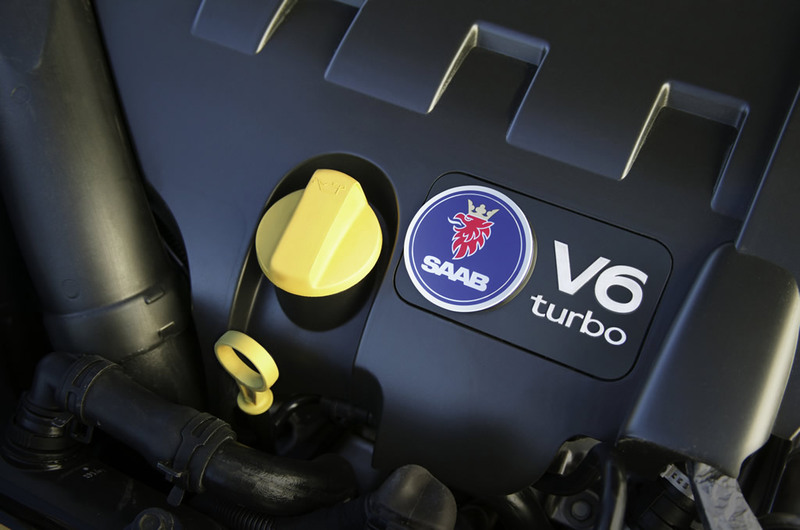 With massive pulling power spread widely across the engine’s speed range, the 2.8 V-6 Turbo generates more torque than most other six cylinder gasoline engines in the Saab 9-3’s market segment. 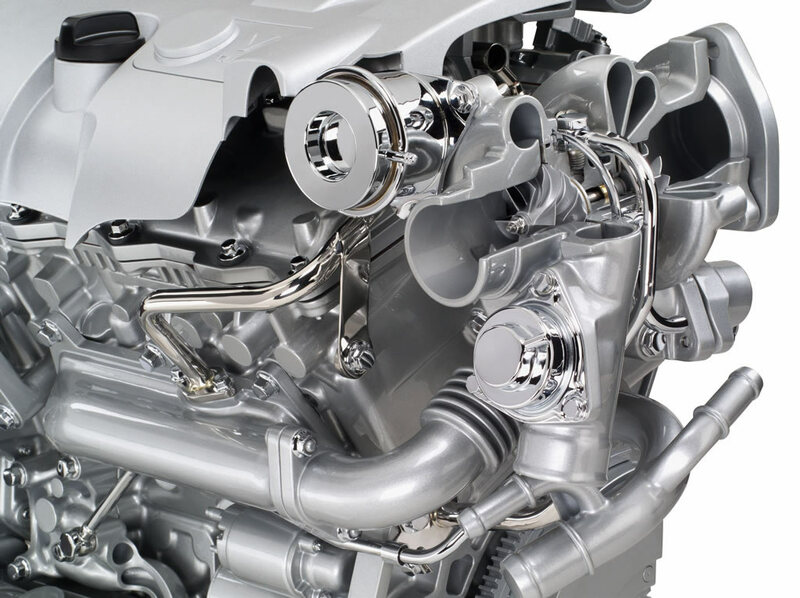 Saab Automobile Powertrain’s expert knowledge and experience of turbocharging is recognized by its role as a Center of Expertise within General Motors for the development of turbocharged gasoline engines. 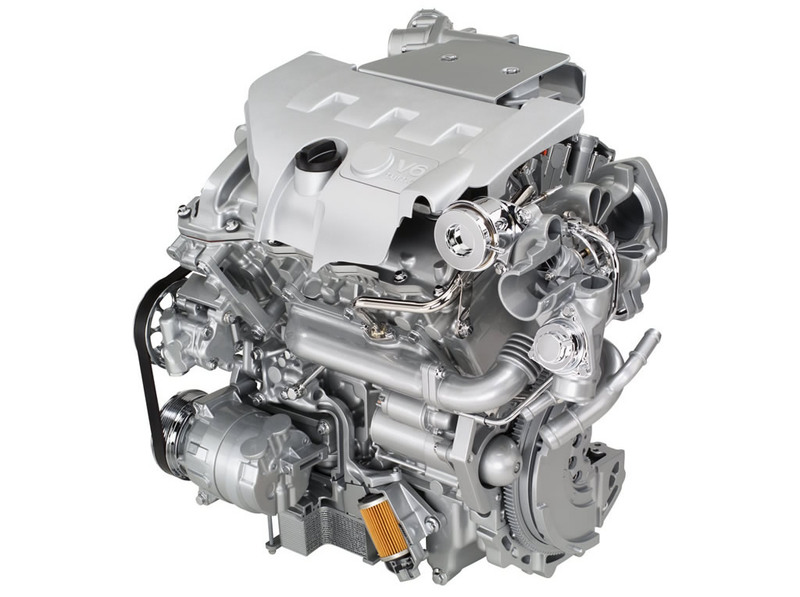 The Swedish engineers were closely involved during the conceptual design and development of GM’s new global V-6 engine architecture, ensuring it included the possibility of a turbocharged application. The 2.8 V-6 Turbo has a 60º vee-angle between its cylinder banks for perfect balance and combines excellent multi-valve refinement with outstanding performance. The all- aluminum construction provides a light and compact architecture, well suited to its transverse, front-wheel drive installation in the Saab 9-3 Aero. The cylinder heads, each with double chain-driven overhead camshafts operating four valves per cylinder, are of high-specification aluminum and unique to this turbocharged variant. The design ensures enhanced heat resistance under 85 bar cylinder pressures, as well as minimum maintenance costs. The twin-scroll water-cooled TDO4-15TK turbocharger operates at 0.6 bar maximum boost with intercooling and an integral by-pass valve. It is mounted centrally above the transmission and fed by both banks of cylinders. The use of two separate inlet tracts, one for each cylinder bank, separates the exhaust gas pulses, improving gas flow, reducing energy losses and raising turbocharger efficiency. The turbine wheel is made from a special high-grade steel alloy, commonly used in the turbocharged engines of world championship rally cars, which is resistant to erosion, cracking and creeping under high temperatures and centrifugal forces. Also unique are double-skin exhaust manifolds, which are hydroformed with stainless steel liners to improve cold start emissions by minimizing heat absorption to the manifold. Air injection into each manifold for up to 30 seconds after a cold start also helps the central pre-catalyst, positioned upstream of the main catalytic converter, achieve “light off” – its effective working temperature – as early as possible. On the road, the new 9-3 Aero 2.8 V-6 Turbo packs a formidable punch and the driver will also immediately appreciate the smooth power delivery, like an iron fist in a velvet glove. Apart from the boost gauge in the dashboard, the only clue to the presence of a turbocharger is an uncannily effortless rate of acceleration. The maximum torque of 258 lb.-ft. (350 Nm) is generated all the way from 2,000 rpm to 4,500 rpm, with 90 percent of this value available at an exceptionally low 1,500 rpm. Careful programming of the engine management software means that under a full throttle load, from take-off or low engine speeds, 90 percent of maximum acceleration is delivered within one second. The zero to 62 mph (100 km/h) dash is accomplished in just 6.9 seconds, but in-gear acceleration provides even more impressive evidence of this engine’s outstanding elasticity. In top gear, the transition from 50-95 mph (80-150 km/h) can be accomplished in just 8.3 seconds, a figure that places the 9-3 Aero among the best in its class. The fun-to-drive nature of this performance is also matched by an exhilarating engine note that can be heard inside and outside the car. This has been achieved by tuning the twin sports exhausts downstream of the main catalyst. It gives the new Saab 9-3 Aero a distinctive aural and visible character in keeping with its position as the sporting flagship of the range. The engine is offered in the 2006 Saab 9-3 Aero Sport Sedan, SportCombi and Convertible with a choice of six-speed manual or automatic transmissions. The close-ratio manual gearbox includes duel output shafts to reduce transmission vibration, together with a dual mass flywheel that ensures smooth, refined performance. For closer driver involvement, Saab Sentronic, a sequential manual gearshift, is also included. When the shift lever is moved across the gate to “manual” Sentronic mode, “up” and “down” changes can be made with full lock-up in third, fourth, fifth or sixth gears. This process goes a step further with the option of steering wheel buttons, which bring gear-shifting right to the fingertips of the driver. Overall, the 2.8 V-6 Turbo generates class-leading levels of torque with a seamless, turbine-like power delivery. It combines the inherent advantages of a six-cylinder engine – refinement and a rapid throttle response – with the effortless, torque-boosting properties of turbocharging. The 9-7x Aero was faster with a 5.5s 0-100km/hr! halifaxf1fan, this is a press release from 2006 and the Saab 9-7 Aero was introduced in 2008. So in 2006, the 9-3 Aero with the V6 engine was the fastest Saab. You are correct. It is a beautiful car.